Westland Distillery, Seapine Brewery, and Ganja Goddess bicycle tour. Join us on an Epic Bicycle Adventure experiencing the sights, sounds, and smells that makes Seattle a gem of a city. Meet us at the Vine St Storage unit directly across from the Edgewater Hotel on the corner of Alaskan Way and Wall St, look for the green SBT signs. (see meet up location) This is where we equip you with your bicycle and helmet. After gearing up we bicycle through Seattle’s Olympic Sculpture Park on our way to the Ballard Locks. You will get a chance to rest and explore this amazing area and really cool salmon fish ladder. 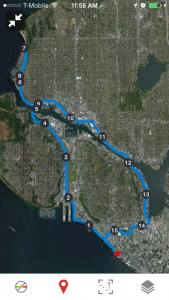 Our bike guides will navigate you through the hipster neighborhoods of Ballard, Fremont, South Lake Union, Seattle Center, and Queen Anne on an amazing interurban bicycle trail. You will experience breathtaking views, old railroad bridges, a boat museum, and so much more. We end our adventure biking through the Heart of Seattle on our way back to the waterfront. Must be at least 12-years-old and 5 feet tall. $69 per person. Daily 9:30am-12:30pm. Rider Experience: Intermediate. Must be somewhat in shape as there are a few gradual inclines on this tour. Most of the the elevation gain is done early in the tour with a relaxing restroom/water break after the toughest technical biking section. Please Note: Must be a confident bike rider as we navigate through many trails and city biking on this Emerald City Tour. This is the #1 bike tour in America.